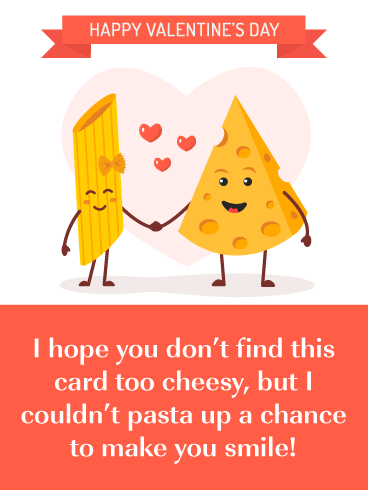 I hope you don’t find this card too cheesy, but I couldn’t pasta up a chance to make you smile! 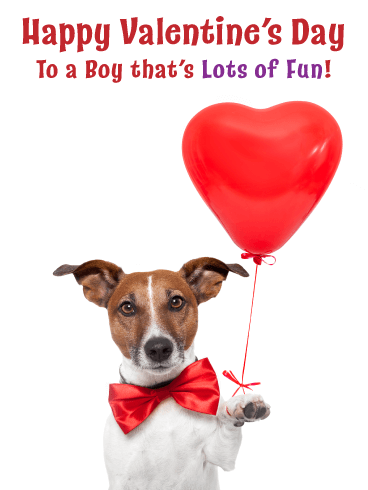 Little boys love puppies, so that means that this Valentine’s Day card will be a big hit! 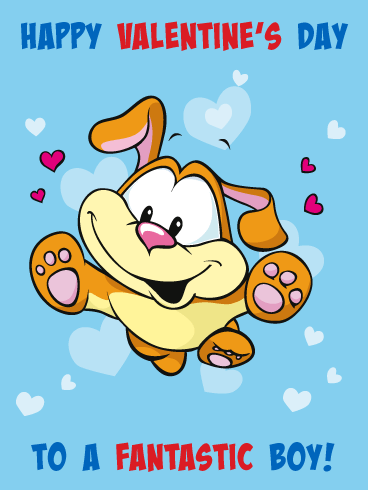 It features a fun and cute puppy surrounded by hearts! This little guy looks so happy because he knows he will be meeting a special boy for Valentine’s Day. Show how much you care by getting this super cute greeting card over to someone special this Valentine’s Day. It doesn’t get much more fun than this card! 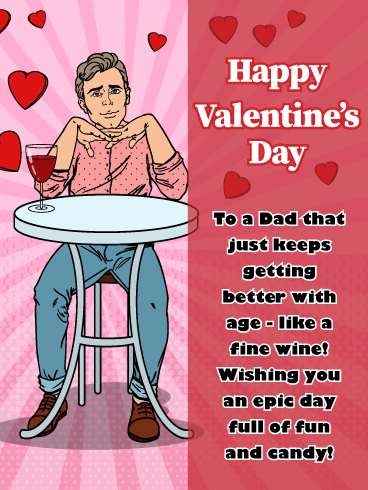 Done in a sort of Pop Art style this Happy Valentine’s Day Card is sure to put a grin on Dad’s chin. Assure that aging gentleman that he is getting better with age just like a fine wine. Wish him an epic day full of fun and candy, cause you’re never too old for candy, right?? A dog wearing a bow tie and holding a heart balloon, who could ask for more! Any little boy would get a kick out of this Valentine’s Day card, so that means you should send it right away! Where else would he get a chance to see a puppy like this. So be sure to add some happiness and fun to a child’s day. He will certainly love it! What do you mean koalas aren’t’ really bears? They have all of the….KOALA-fications! 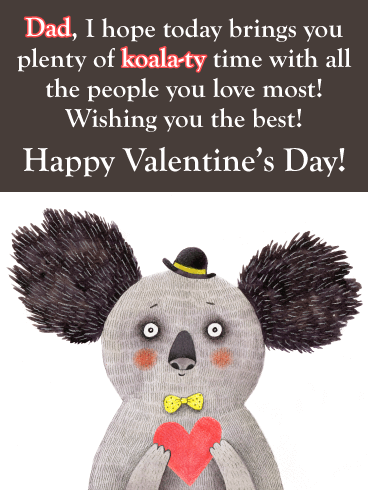 Sorry for the bad joke, but if your dad has a sense of humor, he will love the Koala-ty Time Funny Valentine’s Day card! The koala bear is wearing a tiny bowler, bowtie, and holding a little valentine of his own! Wish dad the best, he sure does deserve it! This adorable car is just waiting to be sent out for Valentine’s Day! 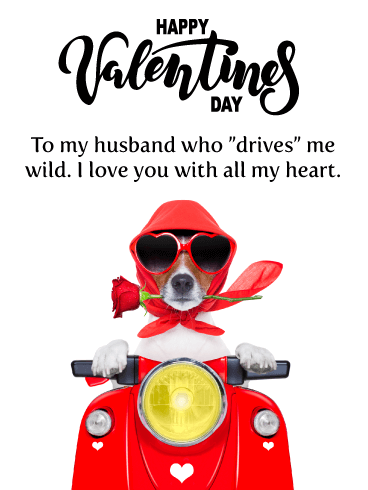 So if there is a special boy in your life – maybe a son, grandson, or nephew, be sure to send this cute Valentine’s Day card to him today! He will love it so much that he will probably show all his friends! Get this car in 1st gear so it will arrive today to wish a child a super fantastic day! Vroom vroom, beep beep! Make way for this incredible card speeding through! 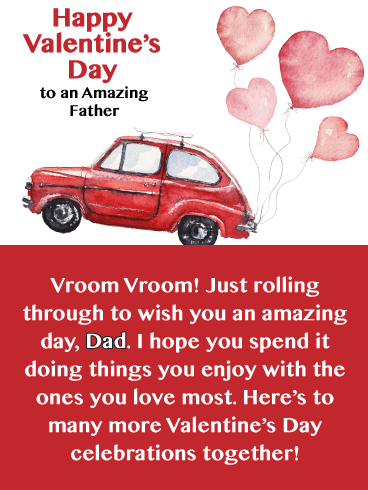 A charming little red car done as a watercolor painting and trailing pink heart-shaped balloons is sure to tickle your dad’s fancy when he receives it this Valentine’s Day. 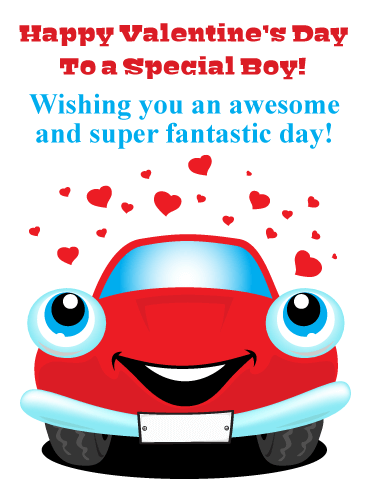 Send the Red Car Card to wish him an amazing day full of enjoyment and loved ones. Here’s to many more! Oh, snap! Someone let the moose out! 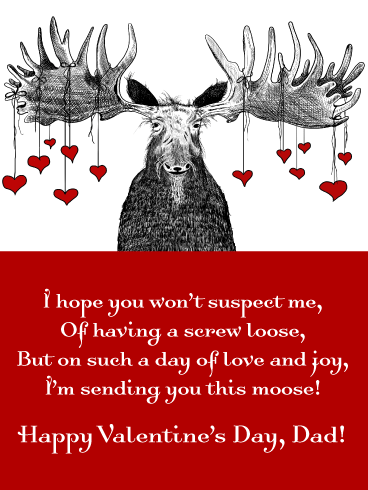 Send your fun-loving dad the Moose is Loose Happy Valentine’s Day card with the silly, rhyming poem to put a huge smile on that darling man’s face! Don’t leave dad out when it comes to Valentine Day shenanigans! The moose has decorative hearts hung from his antlers and this card just couldn’t be any goofier! Every boy loves Valentine’s Day, especially when they receive greeting cards that make them smile. This wonderful Valentine’s Day card was designed with a little bear holding a present as he is carried away by heart balloons. 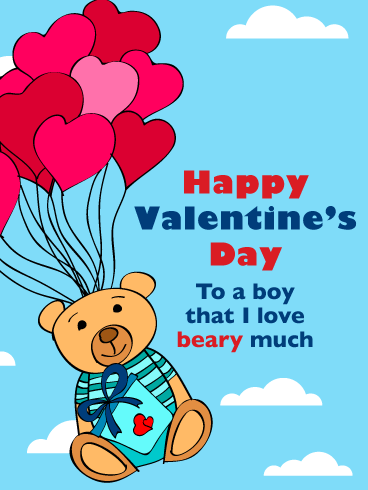 Any child will love this special greeting card, especially when he sees that you wrote that you love him beary much. It’s so super cute! 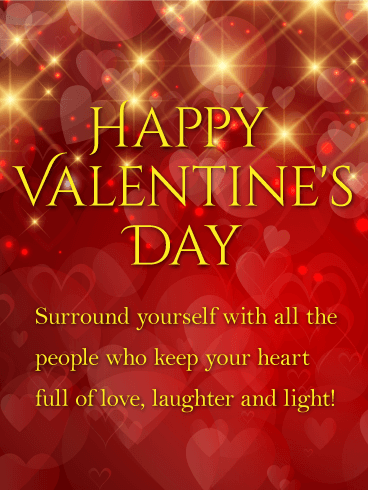 This bright and happy Valentine’s Day card will add joy to any boy’s day! It features great colors of yellow, purple, green, and red, and will be sure to capture his eye the moment he sees it! 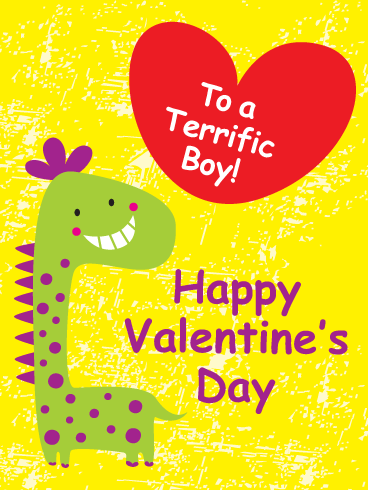 Let the little boy in your life know that you are thinking of him today by sending this cute dinosaur his way! 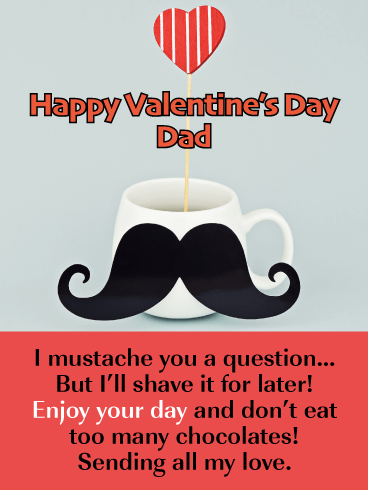 Whether your pop rocks a mean ‘stache or not, there is no doubt he will appreciate you sending him the Mustache You a Question Funny Valentine’s Day card! The card claims you must ask him a question…or rather “mustache” him a question! Buuuut you’ll save (shave) it for later! Haha! Send him love, send lots of giggles, and definitely send chocolate!